Difficult to know how to vote on this without knowing what the quality is like - Lidl never usually lets me down though. in nothrern ireland it started sale yesterday for £75, not as good as halfords advanced professional150pcs but more usefull as it is only metric,forand no lifetime warranty like you get from halfords. bought yesterday, did coupple jobs and i tink ratchets will break after some time. All ratchets will break if used on heavy jobs, but for rusty bolts, just use the solid metal extensions and protects your ratchet. If it breaks, usually they choose not to replace it, and the best you can hope for is to buy another one that will fit the case slot. 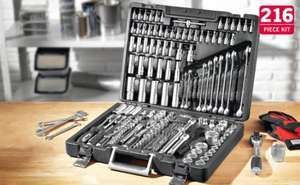 The ratches will break but if you replace them with decent ones you have a kit that will last forever, These sockets sets are as good quailty as anything you can get from halfords at half the price.